Two big traffic shifts are scheduled to occur shortly after the July 4 holiday and will last for six months. The first will affect northbound Interstate 5 traffic when all northbound lanes will move onto a newly-built northbound I-5 bridge over I-705. Once that traffic shift is complete, an even bigger shift, this time to southbound I-5 traffic, will occur. 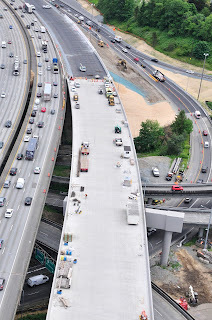 Starting July 10, southbound drivers will notice changes being made to southbound I-5 approaching Tacoma as crews place barrier and restripe the southbound lanes into two distinct roadways. In this temporary southbound alignment, the two lanes to the right of the barrier will provide access to exits that serve State Route 7, I-705, SR 16, and South 38th Street. The three lanes to the left of the barrier will serve travelers heading toward Olympia and beyond. This temporary alignment will be put into place over a week of night closures starting July 10. Piece of cake, right? It will be as long as you plan ahead and know what to expect. To get the temporary southbound alignment into place, an around-the-clock weekend lane closure will take place. From 11 p.m. Friday, July 7 until 5 a.m. Monday, July 10, crews will close one lane of southbound I-5 near the Tacoma Dome to rebuild the center median of the highway. This will likely create big backups coming out of King County. Drivers are advised to travel early when traffic volumes are lower, and build extra time into their trips. Once the center median work is complete, crews will move the three left lanes of southbound I-5 onto the former northbound lanes and begin installing barrier to create collector/distributor lanes. The I-705 and SR 7 on- and off-ramps, and the exits to SR 16 and East 38th street will be re-striped. This work will occur during overnight hours throughout the week, and will involve lane and ramp closures to implement. While some of this work is weather sensitive and could be delayed, the goal is to have the temporary southbound configuration in place by Friday, July 14. 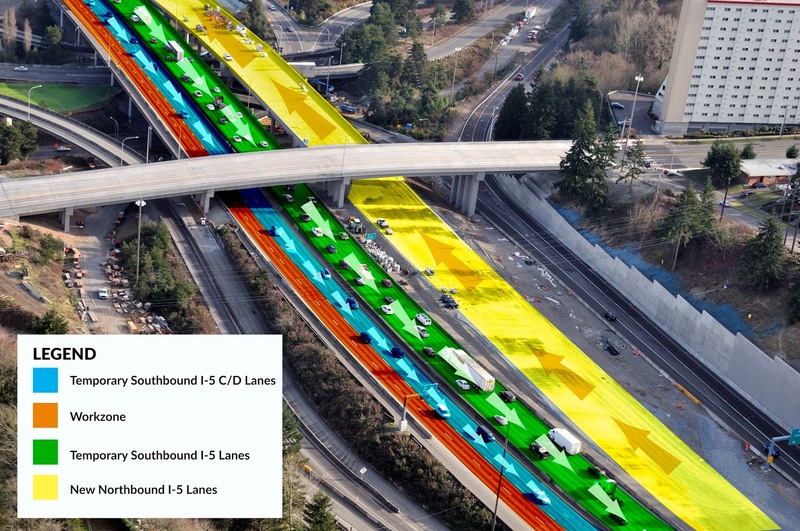 The new I-5 lane configuration through Tacoma. Soon northbound lanes (yellow) will be placed on a new, permanent aligment and three southbound lanes (green) will be moved onto previous northbound lanes. Blue lanes will be temporary southbound collector/distributor lanes and orange represents the work zone. Why separate southbound I-5 lanes? This temporary lane configuration creates a work zone allowing crews to advance work on the McKinley Street overpass and rebuild the outside lanes of southbound I-5. It will be in place at least through the end of 2017, and longer if weather delays construction progress. Amongst these closures and traffic shifts, we do have some good news to share. Along with the southbound traffic shift, this next phase of construction will bring some relief to eastbound SR 16 drivers heading to northbound I-5. Once traffic is moved onto the new northbound alignment, the ramp from SR 16 to northbound I-5 will once again be two lanes instead of one. Enjoy this temporary respite, as the dreaded single-lane ramp will have to be implemented one more time before construction is complete. We know the commute through Tacoma is not easy these days because of on-going construction for HOV lanes. We appreciate your patience and ask for your help in keeping work crews safe. Drive safely. Pay attention. Limit distractions. Work zones are an inconvenient yet necessary part of the process to improve our state highways. We ask that you slow down and give our crews a brake, for safety’s sake. Thank you for an excellent video to help us understand the lane changes coming up. That's a great service! Excellent video and supporting graphics! Thank you for laying all this out like this! It's extremely helpful to plan ahead of time, especially since this will happen right after a busy weekend/holiday. The colorful graphic of the lane reconfigurations is helpful. Can you create one that shows all the lane changes between I-5 Exit 135 and 38th St? The one you current display is pretty limited. It would be really helpful to get a sense of the whole thing, especially the southbound segment...how one can get from downtown Tacoma via the 38th Ave exit (132A). Thanks! The video is fantastic! Nice job with communicating this big change! How much longer is this project really going to take to be done? This started when I was just a young kid, roughly 15-20 years for this overall small revamp? Garin Kartes: Great question. We are down to the final 4 funded Tacoma/Pierce County HOV projects. There are three active projects spanning 7 miles of I-5 in Tacoma right now. We anticipate that two of them will wrap up in 2018, with the third finishing in 2019. The last project, which will build a new southbound bridge across the Puyallup River and extend the southbound HOV lane, will begin 2018 and finish in 2021 or 2022. Is there any way to get onto I5 southbound towards Olympia from 705? Scott B: Thank you for the suggestion. We will pass this on to the construction office overseeing the project. Scott Mars: Take the I-705 ramp to southbound I-5. You will take the collector distributor lane to the 38th street exit, and merge back on to southbound I-5. Has there been any thoughts about connecting 509 at the end of SeaTac airport to 509 in fife making another north to south freeway? Is construction on the freeway now just a "band aid"? What about the highway 16 on ramp to I-5N? The back in the area is a constant and adds upwards to 40 mins to a commute. When will that be fixed? I am a worker on this project, and I can promise you that we have NOT been working in this area for the last 25 years. Yes there has always been construction going on, on i5, but it is for the best for you. You demand safe roads, well guess what, then there's going to be construction. So yes, be patient as we get the work done! James Cook, as stated in the blog, the eastbound SR 16 ramp to northbound I-5 will go back to two lanes. Right now it is currently one lane, which is one of the reasons why there is congestion there. The two lane configuration will stay in place through the rest of 2017, before it goes back down to one lane until the end of the project. We do appreciate driver’s patience while crews work to complete construction. Work zones are an inconvenient yet necessary part of the process to improve our state highways. We do ask that drivers slow down and give our crews a brake. Wayne Oeming, great question. We had to do some digging on this, but here it goes. SR 509 was originally adopted in the late 1950s as a north-south freeway from Seattle to Tacoma paralleling I-5. Right-of-way for the freeway was purchased from Seattle south to SR 516 (Kent Des Moines Rd). Construction of SR 509 was then completed to South 188th St in SeaTac. In the early 1970’s, resistance emerged to extending the freeway south through the Des Moines and Federal Way neighborhoods and no further action was taken. In the 1990’s, the southern part of SR 509 was constructed from Tacoma across the tide flats. Also, during this time frame WSDOT began evaluating alternatives that tied the northern part of SR 509 into I-5 in the areas of SeaTac, Kent and Federal Way. In 2003, WSDOT received environmental approval for what we call “Alternative C2”, which extends SR 509 as a 6 lane facility from its current end point at S 188th Sts south to tie in with I-5 around S 210th St, with improvements provided along I-5 down to Federal Way. More recently, in 2015 the legislature provided funding towards completing SR 509 as well as completing SR 167 under the Puget Sound Gateway program. Here are links to the project web pages which includes more details in the project library. We appreciate the scope of the work being done while thousands of cars are going by the work zone 24/7. This is NOT a small project. The video makes it much easier to understand. We live in the Hawthorne Hills Condos and have a front row seat of the work and traffic. By the way, when will the D Street Bridge be constructed? I just watched the video. The video says there will be two lanes but shows only ONE lane for southbound traffic exiting to SR 16 and 38th Street beginning just after Portland Avenue? Really? They can reconfigure these lanes all they want, but they'll never stop bottlenecks. All of these "improvements" are merely giveaways to the contractors who greased the right palms. The only thing that will solve traffic woes will be when cars drive themselves and eliminate traffic jams. Unfortunately, that scenario is decades away. I wish the video had been shot during the afternoon commute for a couple of reasons. Moving to the right after the second FIfe exit is a terrible idea. The right lane is stopped while people pile -unmetered- onto the freeway. This far right lane continues to struggle and often stands still while people exit on Puyallup Ave. And the area where the video shows gaining a SB lane is another extremely backed up spot due to everyone coming on from Portland Ave.
Moving right during any point in your video is ill advised based on traffic patterns. The second lane should be equally avoided as people are jockeying for position as they enter from Port of Tacoma and Puyallup Ave on ramps. I wished you would have pushed the lane separation a. It more to the south. It would have made it safer for those needing at access the two right lanes. On a side note, the stretch of freeway between 54th and Port of Tacoma has had its striping moved so many times that on days where the roadway is wet and the sun is shining, the glare on the roadway makes it impossible to see the lane lines in the fast lane and lane next to it. What ends up happening is that as we approach Port of Tacoma overpass the drivers in the fast lane realize they are driving on the shoulder and they're lane is about to end, which causes the next lane to have to shift, and so on. Very Dangerous. If you would please identify the current lanes more prominently, it would be greatly appreciated. It drives me nuts how this state constantly places On-Ramps directly before Exit ramps on freeways - the biggest cause of bottlenecks, in my opinion. You have cars trying to get on the freeway directly before cars trying to get off and they have to find a way to cross each other. Wouldn't it make more sense to get cars OFF the freeway (via an exit) BEFORE the on-ramps? I know it would make things easier and flow better. But, nobody seems to learn from this horrible configuration. Thank you for your comments. The D Street/ McKinley Street overpass is expected to be finished by next summer. This upcoming traffic shift will allow crews to advance work on the interior bridge piers. HDawn: The temporary collector/distributor will have two lanes and will serve drivers heading to I-705, SR 7, SR 16 and 38th Street. Drivers going to southbound I-5 from Portland Avenue and I-705 will go into the C/D lane and merge back onto southbound I-5 just past 38th Street. When will the highway 7 onramp to soutbound i5 re-open? Why is the C/D configuration temporary? lys: Thank you for your comments. The video was shot using a GoPro camera shortly after noon on Friday, April 28. The location of the lane separation is based on where the work for this project needs to occur. We will share your comments about the striping between 54th and Port of Tacoma Road with the contractor working on the Northbound HOV project. brilliantgenius1: There will not be adequate space to make a permanent C/D roadway once the HOV lanes are added and all lanes, shoulders and ramps are in their final configuration. A C/D configuration would require an extra shoulder plus width for the barrier.